Yum! I’m lovin’ grilled chicken…especially when it is super moist and full of flavor. 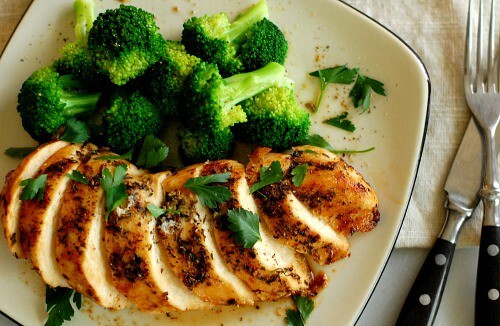 This herb crusted chicken breast is fantastic. What makes it good and tasty is not only the spices, but the method I used to make this chicken breast. 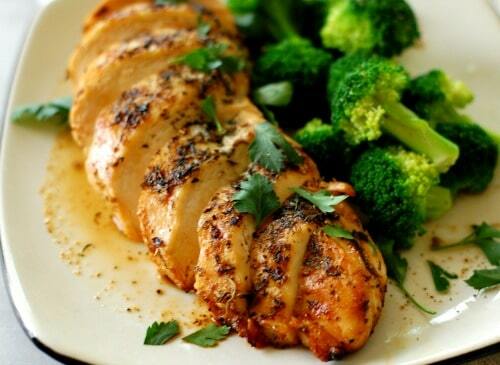 Have you noticed that it seems like boneless, skinless chicken breasts seem to be getting bigger all the time? The breast that I cooked up for this photo shoot was a full 11 ounces of meat. Enough for MaryJo and me for a meal. What this means too is that these thick kinds of breasts can be grilled in a skillet and then finished off in the oven. I’ve found that when you do your chicken this way, that it stays a lot more moist and tender. I prepped the chicken by very lightly coating it with olive oil, then adding a little Kosher salt, garlic powder and herbes de Provence. Actually, you can pretty much use any savory spices you want. The herbes de Provence contains rosemary, fennel, thyme, basil, tarragon, dill, and oregano, so it is combination of spices I really like. I heated up my cast iron grill pan until it was really hot and seared both sides of the chicken for about 4 minutes a side. I then placed the pan in a pre-heated 350° oven. It took about 12 minutes to get the chicken to register 140° on my instant read thermometer. I then placed the chicken on a cutting board and covered it with foil for about 5 minutes to rest. Then just carve it up and serve! MaryJo and I actually had chicken cooked the same way last night and it was so good I wanted to share it with you. I fixed some lemon and herb quinoa to go with it, along with the broccoli. 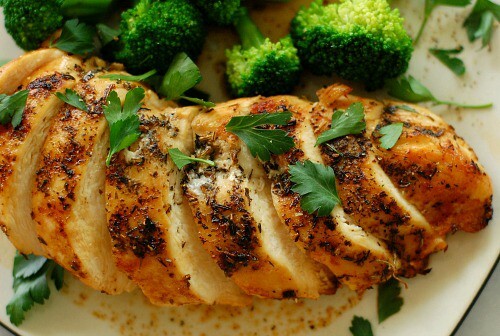 Try this method of cooking your herb crusted chicken breast, especially larger breasts. It turns out moist and tasty. 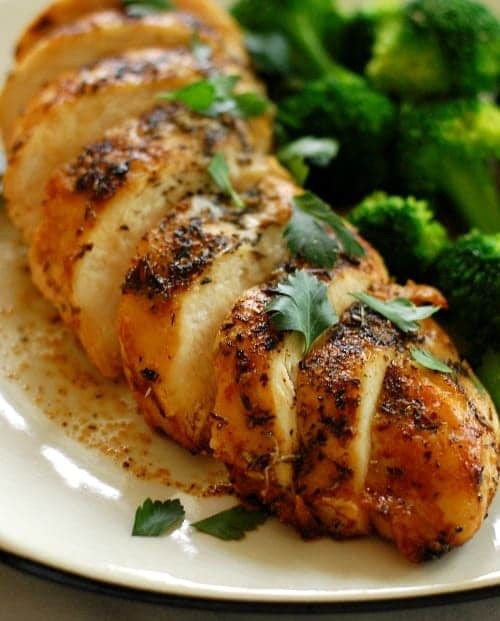 I'm lovin' grilled chicken...especially when it is super moist and full of flavor. This herb crusted chicken breast is fantastic. 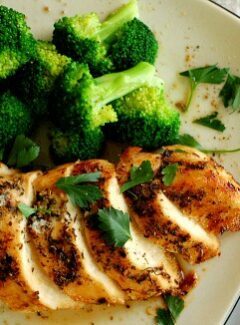 What makes it good and tasty is not only the spices, but the method used to make this chicken breast. Lightly coat chicken breast with olive oil, then sprinkle all sides with salt, garlic powder, and herbes de Provence, (or other spices as desired). Lightly oil a heavy, oven safe skillet, (cast iron grill pan) and heat on burner to medium high to high. Sear each side of the chicken for 3 1/2 to 4 minutes. Place the skillet into the oven and bake the chicken until the internal temperature is 140° as checked by a thermometer, 12 to 14 minutes depending on the thickness of the breasts. Remove the chicken and place on a cutting board or plate and cover with foil to rest 5 minutes. Serve your delicious breast of bird! 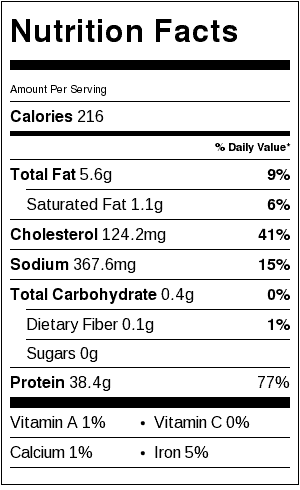 The nutrition information and ingredients quantities are for a chicken breast that was 11 ounces. 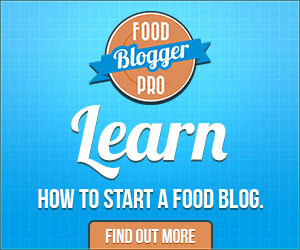 This looks like a really delicious way for us to use some of our chickens this year! Soooo good, and with the broccoli and quinoa, it’s a great dinner. sounds good. Can’t wait to try it! Looks great! Can’t wait to try it out!